Did someone say, “lifted SUV”? We’ve got you covered at Superlift. 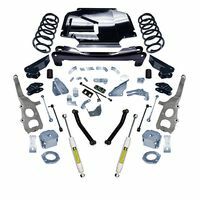 We have dozens of Jeep XK Commander lift kits for you to choose from, so you can customize your ride just the way you like it. Our lifts work hard to really get your SUV off the ground and help you create the perfect lift. If you love to go off-road, you’ll need one of these lift kits to make it through some rugged terrain. Regardless of where you like to drive, a few extra inches of ground clearance will give you more peace of mind as you try to avoid all kinds of obstacles. You’ll also have more space for heavy-duty tires, helping you power through the mud and snow like a champ. Go off-road and take your Jeep XK to the next level!